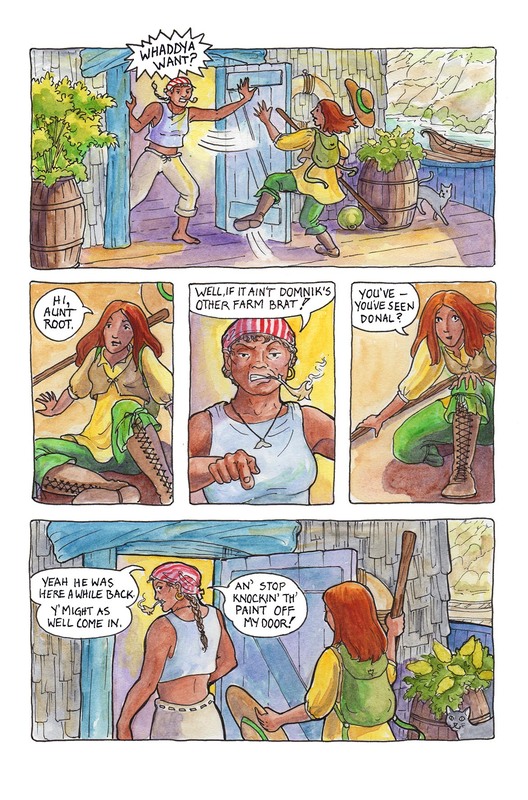 This comic was posted in Mermaid Music and tagged comic, graphic novel, houseboat, Karen Gillmore, mermaid, watercolour, webcomic. I like it so far. Great art, the story has left me hanging, wanting to know whats going on with Do al and even who the “little girl” is. Great start. I have always wanted to write a graphic novel but my drawing is that of a noob. I will have to collaborate. Great work! Hi there! Thanks very much, it’s good to hear what other people, particularly writers, think about the story. I’m hoping to keep the interest level high — this is my first time working in a longer comic form with my own writing! I peeked at your blog — your script about the “difficult decision” would make a fine short comic (Script-writing is pretty much what comic-writing is). You mentioned it was for a class — why not team up with someone else, maybe from the art department at your school? Your descriptions are clear enough that anyone with illustration experience would have an excellent framework to start with. Best of luck with that!